Have you ever looked at farmers and wondered why they tolerate so many things like drought, flies, farm attacks, weak prices etc, etc? Have you any idea why? Like a doctor, a parish priest, a mechanic, farming is a profession. It’s what they know and it’s what they do well, and it’s why their children who live in cities, continue to ask forever have you had any rain? It’s why their children know that behind the city lights and all the money, theirs is a life in which very little doesn’t owe its origins to a farm. Statisticians and “log-watchers” invariably ask a lot of questions of us as the season draws to a close, more so when we’re in contention for the Breeders’ championship, as we have been for the past twelve years. There’s a reason why horses from Summerhill run more often than most, and there’s a scientific explanation for the 9kg increase in the average birth weight of our foals compared with their counterparts of a decade ago. You’ll understand our elation at the recent announcement by the international scientific community that El Nino is now in rapid retreat, which means we can start looking forward to a “flip-flop” in our climatic fortunes. It's a beautiful time in the KZN Midlands, April, and if we had to pick our favourite month, this one would be part of one hand. Most days, you can count on the weather, and the spectacular time is upon us when the emeralds of February and the golds and burgundies of March, tell us its Autumn. There’s an old saying that “you can take a man out of Africa, but you can’t take Africa out of a man.” It’s grown up around the exotic beauty of this continent, its sounds, its scents, its people, its animals, and as much as anything, its atmosphere. Could this be our boat coming in? I suppose some of the joys in life are universal, others are personal: the life of Nelson Mandela, for example is an instutionalised source of pride for South Africans: a crushing defeat (or any defeat for that matter) of the All Blacks is cause for national celebration, or closer to reality, a thumping victory for the Proteas over the Australians, tickles the lot of us. Closer to home, a granddaughter’s performance in a school play, a “home-run” for one of our school students, or a rousing win for a first-timer, all these things get us up in the mornings. Hey, how about this? When John Motaung stood on the podium at the English National Stud in the last week of June, he became the second Childwick scholarship graduate of our School of Management Excellence in three years, to be anointed Top Practical Student of the Year at that venerable institution. Within days, our traditional dance troupe cracked the nod to perform at the world’s greatest pageant of its kind, the Royal Edinburgh Military Tattoo. The previous month, a former pupil of a local government school was crowned the world’s most influential business person by Time magazine. Summerhill CEOThe great animal migrations of the world have forever been a source of fascination (and often enough, of sustenance) for human beings. Visually, the most famous of these is the annual wildebeest and zebra charge across the Mara River from Tanzania into Kenya, at the back end of the Southern Hemisphere winter. There is, in the whole wide world, nothing quite as spectacular or terrifying as the sight of these ravenous creatures braving the treacherous crossing of those murky waters, beneath which lurk a thousand crocodiles and across the banks of which lie a hundred hungry lions. “Theirs not to make reply, theirs not to reason why, theirs but to do and die: into the Valley of Death, rode the six hundred,” is how Tennyson might describe it. We Natalians know better, though. While the visual carnage is hidden from most of us beneath the waves of the Indian Ocean, numerically, the greatest migration on earth is the annual sardine run on the east coast of South Africa, where mile upon mile of these gleaming visitors to our shores face the plunder of the great ocean predators, sharks, dolphin and game fish, not to mention the seine netters and the fishermen, for months on end. And it’s all about food, as it has been ever since homo erectus departed this continent for the outer world some 65,000 years ago. March is a beautiful time in our neck of the woods. The first twinges of autumnal freshness greet the rising sun, the days are blue and the countryside is mellow. Occasionally, and particularly on the full moon, the seeded husks of the oats and the rye plantings burst forth under the late afternoon “splash” that delivers winter’s harvest: the soils are deep and complex, a legacy of the minerals deposited by millions of years of the Drakensberg sandstone’s degradation, and soon nature’s generosity leaves a profusion of emerald splendour. There are many fine farming localities on the planet, but few can match the bounty of our valleys. Long before the advent of the great economies of finance, industry and technology, the most precious commodity on earth was good land, and nowhere was there a greater contest for the spoils of a region than the vicinity in which we’re lucky to live. The Zulus, the Afrikaners and the British all have proud military stories to tell, yet it was here, within a couple of hours of the Summerhill office, that these three nations battled it out more doggedly and more fiercely than at any time in their previous histories. Without knowing the consequences, some twenty years ago, we embraced the idea that nature was our master (or our mistress, depending on your persuasion) and, rather than trying to beat her, we needed to work together. Our old friend, the world-feted conservationist, Dr Ian Player, taught us that “nature has plenty of time: in the end, she will get her way”. He was right; the courtship was not an overnight process, we had to purge ourselves of conventions, get to grips with how nature works and undo all the things man had done to alter her ways. The harmony that followed came from a realisation that we couldn’t compete with the big money in breeding unless we discovered other ways of producing an “edge”: one of these was harnessing the advantages of our environment, our climate and the virtues of our people, and the rest would take care of itself. The proof of the pudding lay in this weekend’s “eating”. The rusty patchwork you see from the Giant’s Castle road, interspersed with the greens and yellows of the last of our summer pastures, comes from the toils of a tireless tandem of the “boys in green,” putting the finishing touches to our winter plantings. The “big dog” 6330 pulls the ripper, the 5725 rumbles along with the disc and the 5503 pats it all down with the planter. As its custodians for the time-being, we all want to leave the land in better shape than it was when we got it, so it’s a complement to our stewardship that as the John Deere’s wind up their work, the crowned cranes, the European storks, our national birds the blue cranes, the hadedahs and the sacred ibis and tens of thousands of seed-eaters, descend on our paddocks. You see, like the wildebeest and the sardines, they’re all driven by the prospects of food, and tilling the soil exposes the smorgasbord beneath it. At Summerhill, ever since we adopted the “green” approach almost two decades ago, we’ve treated the soil with the tenderness you’d reserve for a new mistress, delicately tickling its surface with kid gloves. Nonetheless, a good crop, like a good lady, requires some caressing, and that means a little inconvenience for those that live below the soil’s crust. 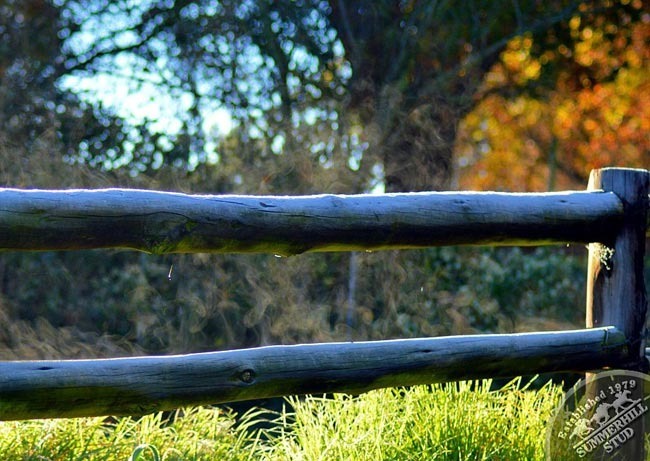 Good land is a natural phenomenon of our area, but healthy land is not always the by-product. That depends on the way you look after it, and when the birds of the air descend in their hundreds to scavenge on what the discs and the planters turn up, you know you’ve got it right. We’re not suggesting that our neighbours are not good caretakers, but for some years now, the birds have known that when the soils at Summerhill are exposed, there’s a harvest of micro-organisms like no other. As we write, a conference of more than 100 crowned cranes crowd the terraces alongside the best piece of private turf in the country: in the land adjacent, like Tweedle Dee and Tweedle Dum, a blue crane gyrates his ritual dance for a disinterested mate: in the land we call Bridal Paths, among a new crop of champions, 60-odd European storks tuck in to the banquet that will take them on the arduous journey back to the clock towers of Amsterdam, Antwerp and Alsace. They come here in these numbers, because they know that here, more than anywhere else, the feast is for a king. Most of the people that made Summerhill “tick” two decades ago, were lucky in their upbringings. Somewhere inside lived a little farmer, a respect for the environment and a love of animals, and they shared a will to sustain what they were about. Fixing the mindset is always the challenge: after that, it’s about blood, sweat and sacrifice, and a big “dollop” of patience. Reversing the damage of sixty years of conventional farming is no instant pudding, and there’s still work to be done. The much-decorated herd of Anguses that greets our visitors from around the world, came from the best families of the best cattle breeders in the nation. As precious as the blood that courses through their veins, is their mutual capacity (with the horses) for eradicating parasites and removing billiary-bearing ticks. The symbiosis was easy to see; you only have to visit a game reserve to witness the “glue” between wildebeest and zebras. In the midst of it all, fortune smiled on us once again. The Anguses are “nature’s gardeners”, and the stable bedding we spread before them on the frosted floors of our winter paddocks, is quickly returned as compost. Our horses sleep on “five-star” mattresses, and this hay resource eventually gave birth to a compost enterprise of mean proportions. We realised long ago that a healthy paddock relied not only on the micro-organisms that reside beneath its surface, but also on the meter or so above, and so we began the business of restoring the land to its original tilth and crumble, by re-introducing the materials and the minerals that had been extracted over the decades. The outcome was a reversion to the way nature intended it. How often do we hear citizens complaining about the moles in their gardens, and the earthworms, the dung beetles and the frogs that appear with the onset of the rains and the first whispers of spring? 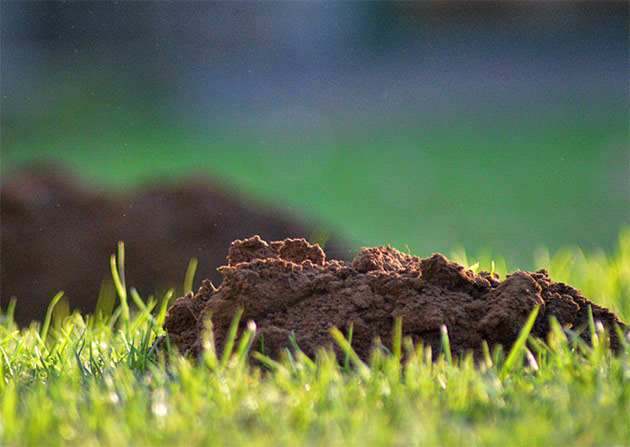 Truth is, moles are the soil’s living aerators, earthworms are the sub-soil conveyors of nutrients, and dung beetles are the outward manifestation of a healthy, balanced environment, just as frogs are. Anything in excess or in absence is a sign of imbalance, and the emergence of these fellows tells us that nature is satisfied, that things are how they should be. As much as we might like to see a Kikuyu pasture resembling a bowling green, to the smart farmer, a couple of mole heaps tells him all is well, that the environment is kind but not necessarily soft, and that the Summerhill claim that we are home to the best nourished horses on the continent, is not just a pipe dream. Summerhill CEORegular followers of these columns will know how much we value our friends. They also know that this is a business that was built on the blood, sweat and sacrifice of a team whose dedication, energy and enterprise knows few bounds. In money terms, there was neither inheritance nor big business behind Summerhill, but what we did receive from our forebears was a history of relationships that extended, in some cases, to the foundation of my grandfather, Pat’s first business, in 1916. Standard Bank, for example, have been forewarned to have the brass plaque polished for our centenary; the same applies to Engen, whose tankers at our diesel pumps go back through seven name-changes to the Atlantic Fuel & Firing Company, 98 years ago. Though we have yet to meet the current partners (and that’s an indictment,) my family affairs are still part-audited by the same firm in Port Shepstone (almost as far away from us in one direction, as Johannesburg is in the other;) for as long as they do a good job, they’ll continue to be the auditors. My grandfather’s association with the erstwhile Massey-Ferguson dealership in Kokstad, East Griqualand, kicked off with a paraffin-burning “vaaljapie” in the 1930s, and until they gave up the franchise a year ago, they’d been the sole supplier of the “red jobs” you’ve become accustomed to in our farm brochures over the years. The status quo never changed as far as tractors are concerned, because it was based on a great product, excellent service and a fundamental trust which endured for close on 70 years. Sentimentally, the closure of E.G. Tractors by the Chapman family marked a poignant landmark in our history, though it coincided, in our view, with a new generation of tractors that didn’t quite measure up to its predecessors. Brand affiliations when you’re growing up, develop in the young mind an affection for your “own” and an aversion towards the opposition, in much the same way as you’re either a “Shark” or a “Stormer” - there’s no in-between. For a boy who grew up on a diet of “Masseys”, I have to confess to a growing envy in recent years, at the presence on my neighbours properties of their flotillas of an arch rival’s products. Besides, the makers of John Deere must’ve known something when they chose their corporate colours (green and yellow) and that sooner or later, they’d prove irresistible to those of us whose racing silks bear the same. Earlier this year, we penned a piece on this great company, which in its entire history has known just nine CEO’s, stretching back 176 years (Read Here). They’re our kind of people, it seems, and they make our kind of tractor: solid, wonderfully engineered work-horses you can bet on. This week we took delivery of a matching pair to join the “big dog” that arrived last planting season. For the average fellow out there, a new car doesn’t always amount to a big deal, but to a Zulu farmer (ask Jacob Zuma), a new tractor is almost as good as a new girlfriend: unlike a BMW, a Mercedes or an Audi, they show an economic return, and for those who keep their stock here, there’s comfort knowing that courtesy of “JD”, your horses will once again be the best-kept this winter. A couple of other things have brightened our days this week, not the least of which the news Monday, that an old South African favourite, Linngari, remembered for his international exploits in the colours of one of Summerhill’s staunchest supporters, Rupert Plersch and Herman Brown Jnr, had his first Stakes winner in France on Sunday. The sire already of a bunch of useful performers from his first small European crop, his son, Mr Pommeroy scooted home by 4.5 lengths in the Prix Policeman (Listed), making him the second Black type performer for his Group One-winning father. Sadly for South Africa, the Aga Khan-bred is committed to a shuttle schedule between Patrick Chedeville’s Haras de Petit Tellier in France and Belair Stud in Brazil, which mitigates against the prospect of his standing at stud in this country. Uncertainties in our export protocols at the time of his retirement stood in the way, as they did in preventing Silvanofrom continuing his shuttle to and from Germany, thus denying local breeders access to the priceless lineage of Tourbillon. Once again though, Sunday’s celebration of his first Stakes winner illustrates the value of friendships. We’ve had an inkling Linngari would make a sire, and last July we proposed to Rupert that we buy a few mares between us to breed to Southern Hemisphere time. As a result, we assembled a package of eight mares with largely French ancestories, which land at Oliver Tambo today. Historically, French mares have made rich harvests for South African breeders, and with a bit of German engineering tossed in, who knows? My wife has always lived by the belief that you should keep the “best for last”, and she applies this maxim religiously to the rare occasions she indulges in a bit of dessert after dinner. Without in any way wishing to demean the arrival of the John Deeres or the emergence of a Stakes winner for Linngari, a week of ten more winners on the back of two consecutive weeks of seven in each, is the doctor’s medicine in the ongoing tussle for this year’s Breeder’s Premiership. Look at the connections, and you’ll recognise a few old faces whose pictures have been regular features of the annual Summerhill Sires brochure. See, the value of relationships. One of our regular correspondents on the blog is a lady with old Hartford roots, Lynn Atkinson. She recently penned a piece on a herd of feral cattle in England, which reminded us of a conference we held in the bowels of the Thukela River valley, one of the remotest places on earth, at the headwaters of the former hunting grounds of the Zulu kings. To get to Zingela, we rode our delegates in on horseback, down a trail which was last trodden by Boer soldiers in 1900, on their way to the Battle of Blouwkraans, named for the tributary that feeds the Thukela in that region. The battle dismembered a number of British and Boer horses from their minders, and they were abandoned to this wilderness to care for themselves in “big five” country, where lions, leopards and other predators roamed. We often read of the feral horses that roam the desert plains of Nambia, abandoned by their former colonial masters, the Germans, but little of the 30 to 40 that have survived the even-more-testing rigours of the Thukela basin, which now forms part of the Thukela biosphere, and is still home to elephant, rhino and the like. In colour, they’re a motley collection of chestnuts, bays and greys, which makes them visibly vulnerable to the preying population, and it says something for their resilience that they’ve survived more than a hundred years in their feral condition. “Everyone knows that the Wild Cattle of Chillingham are a phenomenon. They simply should not exist, according to our theory of survival. Yet they do. To understand why and how, we must abandon our short-sightedness and accept the Laws of Nature, demonstrated by that herd day in, day out. Eight hundred years ago, and sickened by the monotony of Scottish raids, the Parliament of Westminster instigated a Border Lord, and commissioned the building of a wall enclosing a square mile. Within it were captured (inadvertently?) a small herd of the wild cattle that roamed across the face of Europe before the sea washed in, and created the island of England. For 800 years, these cattle have lived within that wall. They have never been touched, never immunised, never has ‘new blood’ been introduced. They are healthy, happy, and thriving, a living relic of the past and a testament to the power of nature. They fascinated Charles Darwin, and are now recognised as a separate specie. They are husbanded from afar. Intervention only occurs in the case of a stomach wound from goring. They calve all year round, no season, and so they obviate the wipe-out of a whole generation by calamity or bad weather. Each calf is examined by the whole herd when it is born. If it is healthy, it is accepted. If there is a defect, it is killed. They practise ‘survival of the fittest’ and ensure that no weak genes survive in their gene pool, which is to say it is now ‘perfect’. They are in fact clones of each other, so inbred that they are the only natural clones know to the world. In modern times, they withstood the foot-and-mouth and BSE outbreaks which caused the national herd to be burned across the country. Certainly, over the centuries, they have withstood much else. They are immune, functioning and self-contained. Their only predator, the wolf, no longer exists in England, and that is the only concession that this herd enjoys over their forebears, who lived outside the wall. They recognise each other by smell, and that is why they are never touched by human hand, for fear of causing rejection by the herd, (in the same way that we never touch a small bird, for fear that the mother will reject it). Nature causes an equal number of males and females to be born, and although there is one Alfa male allowed to breed at a time, selected by pitting itself against all comers, all the other males are accepted by the herd; none are killed unnecessarily so the herd has maximised its recovery position. They have as many backup bulls as possible. Nature sees to it that few unnecessary risks are taken, because there are quite enough unavoidable risks involved in the survival game. Not only has the herd, which at times has been down to 20 individuals, survived and thrived ‘alone in the world’, but their pasture has also never been tilled, fed, cut or interfered with in any way. There are sheep, because there have always been sheep, so the pasture is the product of sheep and these cattle, which graze like sheep, that is they cut the grass rather than pulling it with a twisted tongue, like modern cattle. The ground is fantastically springy, thick with dense growth and we know that per square yard, it has almost treble the number of species of similar ground outside the walls. The Chillingham herd behave extraordinarily when threatened. They form a circle, calves in the centre surrounded by the cows, the bulls on the outer rim, but not standing horns out. They mill and they prod each other, increasing the adrenalin and anger levels in the process. They put themselves and each other on a war footing, the human equivalent of the Zulu war dance, a frightening sight from whichever side of the fence you’re on. 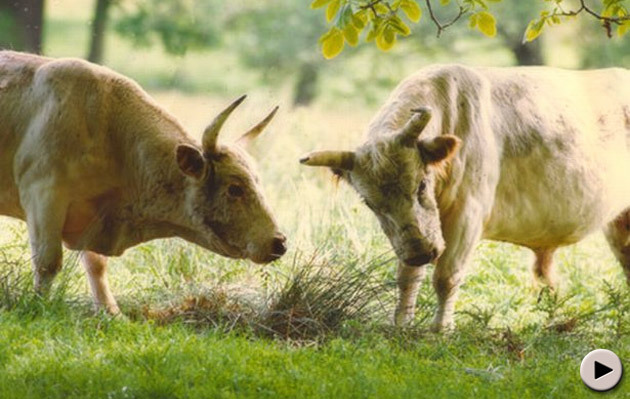 The Chillingham herd are small, not unlike Jersey cattle, and they have the same triangular heads. They are white, with soft curling coats and wonderful horns. Interestingly, thirty or so years ago, an abandoned island in Scotland was used for grazing a herd of Aberdeen Angus/Shorthorn. They are now feral. One bull with all the courage in the world stands between anyone in a boat and his herd. They are even wilder than the Chillingham herd; so it does not take long for the tame and dependant to revert to self-sufficiency. That is good to know. Now if we look at what the British in particular have inflicted on themselves in the same time the Chillingham herd have spent within the wall, we can understand why the outcome is the reverse. For we are living through the Fall of Britain. Perhaps these things are best left to Mother Nature, and therein may lie a lesson for horsebreeders. Statisticians and “log-watchers” have been asking a lot of questions of us as the season draws to a close. There’s a reason why horses from Summerhill run more often than most, and there’s a scientific explanation for the 9kg increase in the average birth weight of our foals compared with their counterparts of a decade ago. For that matter, there’s a sound basis for the fact that Summerhill-raised horses contract illness less frequently than most, and it’s to do with their immune systems. It wasn’t an overnight process, because we needed to educate ourselves into an understanding of how nature works, and to undoing all the things man had done to alter her ways. The harmonisation which followed was part of a realisation that we couldn’t compete with the big money in breeding, and that we had to find other ways of doing things that would provide us with an edge: one of these was to harness the advantages of our environment, our climate and the virtues of our people, and to get the small increments that accrued from each of these, to work to our benefit. The advent of tractor power and the revolution that flowed after World War II from the conversion of the explosives industry into the fertiliser business, turned the agricultural world on its head, dramatically raising productivity and yields on farms. But this revelation came at the expense of the integrity of soils and the elements of nature that had for so long sustained the natural world. Pulverising soil with mechanical power was a wonderful substitute for the old horse or cattle-drawn plough, and converting the massive explosives manufacturing businesses into makers of fertiliser, was an act of ingenuity of matchless proportions. What few people understood at the time, was the impact this would have on the productive agricultural environment over the next 50 to 60 years, and it’s only now that we’ve come to appreciate the desperate need for us to find a balance between nature and commercial expedience. Soils were being destroyed, and synthetic fertilizer was like a drug. Most of us that made Summerhill “tick” two decades ago, were lucky in our upbringings. Somewhere inside the lot of us was a “little farmer”, a respect for the environment and a love of animals, and fortunately, there resided in all of us a determination to preserve the sustainability of what we were doing. Getting the mind-set right is always the biggest challenge in circumstances like these, and once that’s done, the rest is about blood, sweat and sacrifice, and a big “dollop” of patience. Reversing the damage of 60 years is not an overnight undertaking, and there is still work to be done. Let it be said upfront, if we’d not attended to these things, we doubt whether we would have won a single Breeder’s Championship, let alone eight in a row, given the limits of our resources and the broadly-held belief at the time, that you couldn’t produce a decent racehorse in KwaZulu-Natal. As remarkable as that may be in hindsight (given the fine histories of the old Hartford, Dagbreek, Springvale and Springfield Studs, and not forgetting Politician and Jet Master came from these valleys), that was the prevailing propaganda of the age, and having made our commitment to this region, purging that from the minds of those who would believe it, was as galvanising a force in what’s happened since, as any. We kicked off our programme with the introduction of cattle, aimed principally at the eradication of parasites in both species (the cattle and the horses) and the elimination of biliary-bearing ticks. The symbiosis was easy to see: you only have to visit a game reserve to see the “glue” between zebras and wildebeest. As a by-product of the cattle, we discovered the benefit of feeding them the bedding from the stables in the winter, and the fact that they could re-distribute this on the land as compost. This alerted us to the realisation that in all the hay we put down on the floors of our stables, we had one of the most bountiful natural resources imaginable, and so a composting enterprise of mean proportions was born. We sensitised our minds to the adoption of a more delicate approach to the breaking up of our land for planting, and to the fact that our soils were crying out for a return to their original tilth and crumble. We quickly realised that the health of our soils depended not only on the micro-organisms and the tiny creatures that resided beneath its surface, but also on the metre or so above, and we began to restore the land to its original form, by re-introducing the materials and minerals that had been extracted over the decades. The outcome was not only a reversion to the natural balances which had existed over the ages, but the revitalization aerated the soil as well as significantly improving its capacity for the retention of water, and hence the return of the creatures we see every day. There was little point in all this if we didn’t deal with our nutrition and our husbandry in the same philosophy. Our feeds division, Vuma, soon became the first manufacturer of organic or bio-friendly horse feeds in the world, and our people led a charge in the way we operate, attracting the attention of some of the leading stud farms of the world. How often have we heard citizens complaining about the moles in their gardens, and the earthworms and frogs that appear with the onset of the rains and the first signs of spring? Truth is, moles are nature’s natural aerators, earthworms are the sub-soil conveyors of nutrients, and dung beetles are the outward evidence of a healthy, balanced and welcoming environment, just as frogs are. Anything in excess or in absence is a sign of imbalance, and we should see the re-emergence of these little fellows as an act of generosity on the part of nature, rather than a warning (as we often do), that things are not how they should be. As much as we might like to see a Kikuyu pasture resembling a bowling green, to the modern, educated farmer, a couple of moleheaps are a good sign that all is well, that the environment is kind, but not necessarily soft, and that the Summerhill claim that we are home to the best-nourished horses on the continent, is not just a pipedream. The one benefit in running a mixed farming operation, is that when the horses don’t bring home the bacon, you can always fall back on the cattle. Twenty-five years ago, Summerhill’s general manager at the time, John Slade (now making a “ripping” success of running Maine Chance Farm for Dr. Andreas Jacobs and his family,) suggested we acquire some cattle to”sweeten” our pastures. Anyone who’s been to a game reserve, will know there is a symbiosis between zebra and wildebeest, and they’re generally grazing together. The secret lies in their mutual reliance on one another in the combat of their respective parasites, and it’s no different in the domestic agricultural world. John Slade is a perfectionist, and he was insistent that if we were going to do it, we should do it properly. There was little point in breeding anything less than the only beef “Woolies” would have on their shelves. 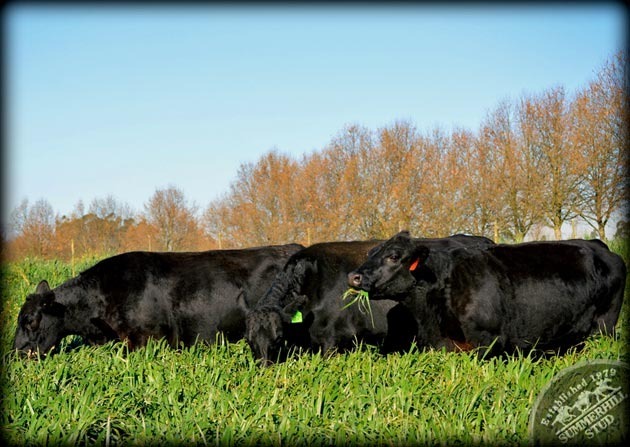 The best herd of Angus cattle in our region belonged to Greenfields Farm, where the late Humphrey James had meticulously welded together the best strains of the best stock of the local breeders for more than three decades. So we were willing to pay “overs” to his successor, Mervyn Thompson, to acquire his genetics. 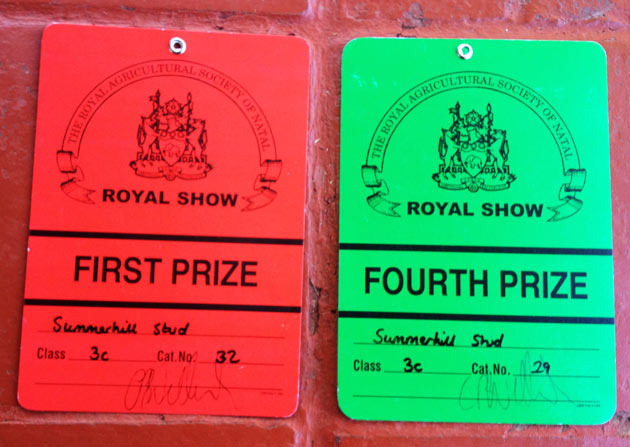 These heifers were the foundation of the Summerhill herd, and in the ensuing time, they’ve earned some thirteen “champion” prizes at local shows, to the point that the revered Robert Armstrong Trophy for the “Best Grass-fed Animal” on show, is now a permanent fixture at Summerhill. And to show that the herd remains in good shape under the stewardship of Haydn Bam and Bongaan Shangase, last week at the “Royal”, they brought home the “bacon” or should we say the “beef”, once again, with a first and a fourth prize in their category. We’ve always considered Norman Bauer and Angus Williamson among the best judges in the business; now we have no doubt! Summerhill is magnificent right now, clothed in a contrast of greens, golds and rubies, that splendid mid-point between the unrivalled spectacle of our autumn weather, and the onset of our winter chills. We woke this morning to another perfect Midlands day; the floors of the valleys shrouded in mist, and the Drakensberg stretching away for 90kms to Sani Pass. There’s no finer sight in all of creation. 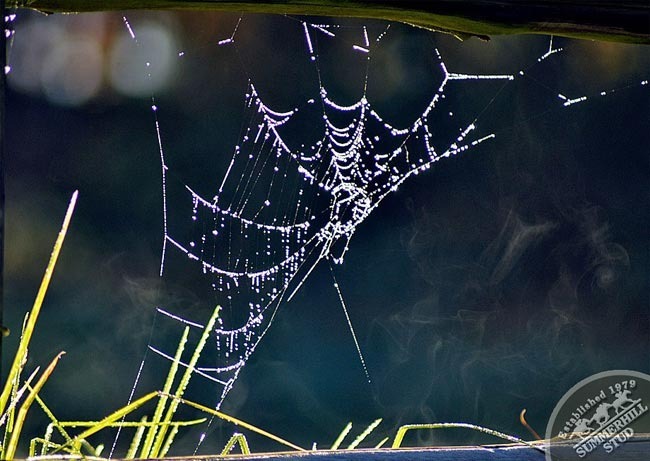 There’s something though, in the cosmic wonder that engineers the metamorphosis between the rising sun and the crystallising of the dew, so we knew what was coming when Saturday morning shivered with the stabs of a Southerly breeze. Historically, we came to expect the first frosts any time from the onset of April, but in the past five years, it’s generally been somewhere between May Day and the 10th of this month. The “Greens” tell us the delay has to do with the melting of the Arctic ice cap, but for those who are lucky enough to live here, the month’s respite means we squeeze another thirty salubrious days out of autumn; even then, when the first frost has arrived, there’s usually another fortnight or so’s “breather” before the mornings are regularly greeted with sub-zeros. As we drove through the floor of the valley on our way to our first meeting at 6:30 this morning, the temperature gauge touched -3°, and we knew we were in for it. Winter was here, and in minutes the farm resembled the inside of a freezer box. The one thing about a frosty morning is that you’re guaranteed a perfect day when it’s melted, and as we pen this piece, we’re headed for the mid 20s on the centigrade scale. While there will be those who will always lament the beginning of winter, there’s one certainty about it all, and that’s that the scourge of African Horse Sickness is no longer. The frosts destroy the midges that carry the disease, and those regions that have suffered the odd casualty because of it, can sigh a collective relief. All being well, we can look forward to the lifting of our export restrictions, and to a new dawn for South African horses racing abroad. It won’t be the first time you’ve heard it, but it’s an old Summerhill adage that “transactions build turnovers, relationships build value”. You also know that there were no inheritances here; Summerhill was built on the blood, the sweat and the sacrifices of a wonderful team, and we are what we are, because our people scripted their own history. That said, what we did get from our forebears was an appreciation of the value of relationships, and we inherited a few of those. Pat Goss Snr opened his first banking account with Standard Bank in 1916 (we’re up for the “gold watch” in 2016), his first fuel suppliers were The Atlantic Fuel & Fire Company (after seven name changes, modernly known as Engen), and he bought his first tractors in the 1930s from East Griqualand Tractors in Kokstad. To this day, we bank with Standard, we’re still with Engen, and until they shut their doors recently, we’ve looked nowhere else for our tractors than the Chapman family. Pat’s first tractor was a paraffin-burning Ferguson “Vaalapie”, which you fired up on low-grade petrol until the engine was warm enough, and then as an economy, you switched over to paraffin. Ploughing was tough in those days, as these little fellows (revolutionary though they were) could only tow a two disc plough in a single lane, and struggled to pull a mower. As Ferguson became Massey-Ferguson, their tractors progressed to the modern giants we see today, and at one time, this Canadian minnow rivalled American giant John Deere, in the quality of its products. Troubled days lay ahead however, and it seemed to coincide with the new generation tractors in particular, despite their appealing resemblance to the Boeing Dreamliner. Agricultural people are traditional in their ways, and are slow to adapt. In their attempt at diversifying their manufacturing base, Massey-Ferguson established bases in diverse places across the world, and while the opinion is personal, it seems it may have come at a cost to quality. Whatever it was, John Deere appeared to have managed a similar process a little better, and they’ve emerged with a reputation which dates back more than a century, not only intact, but enhanced. In the process, one or two MF dealerships have sadly ceased to operate, one of which belonged to our old friends in Kokstad. It’s fair to say that whilst we maintained our loyalty throughout this transition, we couldn’t help looking across the farm fence at our neighbours, where the local penetration of John Deere is reputedly approaching 70%. 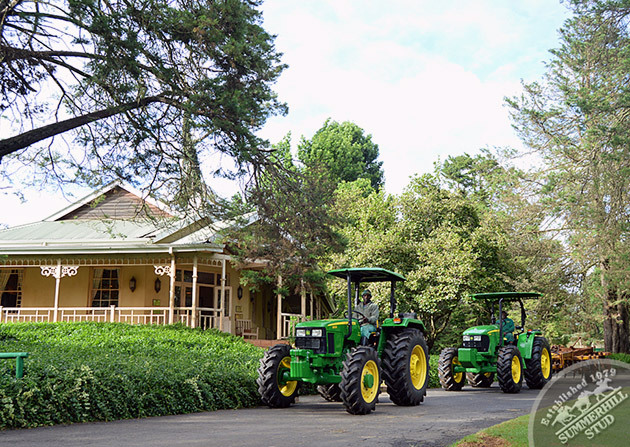 While the appeal of their tractors lay largely in their performance and reliability, for Summerhill there was an added attraction; like us, they come in green and gold. The Chapman relationship has endured for close on seven decades, and as families, we’ve shared more than a half century in Christmas dinners. As long as they were in business, we were in business with them, but since that has changed, we’re wearing different clothes these days. The history of Deere has a resonance with our own, though it’s even older. The company was founded in 1837 by a blacksmith named (you guessed it, John Deere); the company he built moved deliberately: it specialised in horse-drawn ploughs for nearly a century, before making the switch to internal combustion. It’s been managed by just nine CEOs in its 176 year history (that’s one every twenty years, on average). One result of that stability is devoted customers, who covet those iconic green caps. The obvious reason for their ascendancy in the market place is their spend on research and development, which averages more than 4% of its annual revenue. This investment has taken Deere quickly into dominant positions in growth markets such as Brazil, Russia and South Africa. That, its reputation for reliability and its dedication to innovation, has been rewarded with faster growth in international markets than any of its competitors. Domestically, it holds 50% of the United States agricultural equipment market, and it ranks among America’s top 50 most respected companies. A lot of things about Deere are as outsize as its big green tractors (the largest comes in at 560 horsepower). The company’s growth, for instance. After ten successive quarters of record gains, Deere reported $32.6 billion in sales for 2012, another record. Its ambition is outsize too: it aims to hit $50 billion in revenue by 2016, and has seven new factories in the works. As for its tractors, bigger isn’t always better. Some of the company’s top selling models are too large for growers overseas, the soil often isn’t as firm, nor are the farms as sprawling as in the US, though that too, is changing as farms expand in grain production. To sell overseas, this venerable old giant has developed a suite of new equipment to appeal to the needs of those in faraway places, like us. Looking at occupancies at Hartford House, it’s apparent that ever more, travellers are wanting a piece of this enchanted kingdom. There is a magic to this place, not only in its natural scenic splendour, but in the colours that herald the changes to the seasons. No time is better though than the autumn, when the mornings are crisp, the sky is blue, and you can see forever. If you’re “horsey”, you’ll know that its yearling prep time, and if you’re familiar with Summerhill, you’d be expecting us to be busy with the weaning of foals and the beginnings of the old ritual of teaching our Ready To Run candidates the ropes. Haydn Bam’s agric unit is frantically baling up the last of the hay, and his tractor pilots have been grinding away in the dark before dawn through the twilight of the evening; discing, harrowing and planting. The welfare of the horses is paramount at Summerhill, as you know, and all this activity is part of the stocking up of the larder for winter, with more than 350 hectares of emerald rye grass, targa oats and a salad of fescue, cocksfoot, white and red clovers, and the lavender of the grazing vetch. 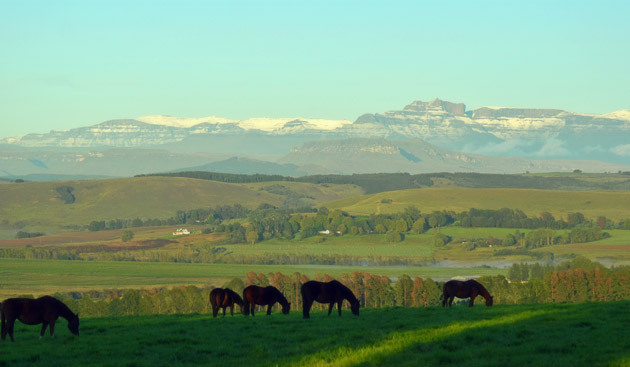 And by the way, we had our first snow yesterday morning, not on the farm, but on the nearby Drakensberg mountains. I said at the beginning, autumn is famous for its blue skies and long views, but you’ll forgive us our joy at the good rain and the full moon brought overnight. Without it, those paddocks beyond the irrigators, would not yield the bounty we would expect in this part of the world from our winter crops. Townspeople are often oblivious to it, but there’s a reason you get spring tides at both ends of the moon’s spectrum, and even in the dead of winter, you can expect a little moisture when the moon is either full or in its newest phase. That’s why those who live by the stars, tell you to plant by the moon. But don’t be deceived: he is the inspiration behind one of Summerhill’s principal initiatives in maintaining our position in the pantheon of the world’s great stud farms. Our “light bulb” moment recognizing the importance of the sustainability of our agricultural practices, dawned about 18 years ago, and arriving at where we are today, has been a long trek. But the real “oomph” came when we teamed up with John Fair some years back, and he took us to the heart of the bio-farming revolution which was considered by many in those days, as “tilting at windmills”. While only a few said it, most thought we were dealing in fairy tales, yet the evidence is everywhere to be seen today in a spectacularly preserved environment and a wonderfully productive farm. Among the many initiatives was a total embrace of the need to farm in concert with nature. The first thing we did was to outlaw, to whatever practical degree we could, the use of synthetics and environmentally-harmful applications. We also knew that there was no shame in a reversion to the “old”, to an understanding of the nutritional and healing value of ancient plants, and that what was new in the conventional sense, was not necessarily better. We could see in our agricultural practices, the destructive influences of constant pulverizing of the soil with deep ploughing and feeding it, like an addict, by-products of the second World War’s explosives industry, synthetic fertilizers. This wasn’t something we could continue to do in the long term. So we started restoring the soils with natural elements, we embarked on a massive composting venture, converting the masses of horse bedding we generate every day, into bio-degradable, highly nutritious manure, and voila! Compost, of course, is not the silver bullet on its own; there are many other natural substances such as limestone, which South Africa has in abundance, and which’ve restored the tilth to the soils, brought back the earthworms and the dung beetles, as well as the many creatures and micro organisms that live in the metre above and the metre below the soil, and which’ve found solace at Summerhill. Suddenly the average birth weight of our foals has increased because of increments in bone density, quickly their immune systems reached new levels of resistance, and concurrently, we climbed the nation’s breeding ladder, all the way to the summit. In conjunction with these things, on John’s advice, we integrated into all of our pastures a mixture of nitrogen-producing legumes, clovers, grazing vetches and the like, which has significantly reduced our dependence on manufactured nitrogens, as well as our total seed costs. As an example, in 2011 seed cost us R240,000: in 2012 the figure dropped to R159,000, and it reduces once again to R138,000 for next autumn. The introduction of grazing vetch provides us with an added 80 kilogrammes of nitrogen per hectare, it carries at least 300% more calcium (so critical to the bone development of our youngsters) than its neighbour, the Targa oats, which while essential to the welfare of our stock, is not quite as rich as the vetch in macro and micro nutrients. Alongside is a photograph of the bounty this interdependency has yielded for us, and especially for our horses, in one of the nation’s richest winter feed harvests. In the end, it’s all about the welfare of the horses, and when you don’t have the money to compete at every level with those who do, you have to find other means of keeping yourself at the top of the mountain with the things you can afford. One of them is getting up with the early bird, and catching the worm! Summerhill Stud CEOThere’s an old saying that goes something like “don’t make the children pay for the sins of the fathers”. It is particularly appropriate in the context of the South African farming community, and especially in KwaZulu-Natal. Politicians can be a funny old bunch, with a habit of distracting attention from their own shortcomings by creating diversions elsewhere. A popular lament among politicians in this country is the poor treatment of farm labourers, and while we are fairly tolerant of the utterances of these people in general here at Summerhill, the one thing that “miffs” us, is the broad generalization that farmers don’t take care of their staff. Let me say at the outset, most of our readers are aware of Summerhill’s social responsibility programme, and the investment we’ve made in the upliftment and growth of our people. It’s one of the pillars on which our eight Breeder’s Championships were built. But what we have done for our people is by no means exceptional: there are great examples all over this province, and indeed, throughout the land, of similar efforts on the part of farmers. We know no other business, not only here, but anywhere in the world, which works harder for the benefit of its staff, than the South African agricultural community, in the provision of housing, education, transport, health and welfare services, relative to the money we turn, and the profits farming makes. How many businesses of our size, for example, can claim to house, as we do, between 600 and 700 people every night of the year? I’ve often said that I am among the luckiest people in the world. I wake up next to a lovely lady, who like me is getting on in years now, but who at one time I would’ve rated in the top ten in the land! My bedroom looks out on a world heritage site, and I go to work with some of the finest people in the world, not only our management team, but specifically our Zulus. Then to cap it, we get to work with the greatest creature the good Lord ever created. What we do to uplift our people is not a sacrifice, it’s one of life’s great pleasures, because they make the sacrifices, and have done so for decades. We make up for the fact that as a farming enterprise, there is always going to be a limit on what we can afford in the way of salaries compared to bigger and richer industries. We compensate by providing homes, water and electricity, garden and refuse services, healthcare and schooling. At Summerhill we have four educational facilities, a beautiful crèche, a junior school which has provided our community with two junior international athletes and a mayor in recent times, a night mentorship and literacy programme for adults, and of course, our School of Management Excellence, (the only one of its kind in the Southern Hemisphere). The staff own 50% of the profits from the farm trading store, and we live in one of the safest places in the world. It’s a testimony to the harmony we all share, that this is so. These endeavours have led to 44 international scholarships at the best farms in the world for our Zulu grooms; four of our young Zulu chefs have represented South Africa at international cooking exhibitions in Zurich, Prague and Shanghai: our traditional dance troupe has ranked third and second in the world in Tokyo and Hong Kong respectively, and in 2012, Thabani Nzimande, a young Zulu from our district and a graduate of the first intake at our School of Excellence, won the award for the top practical student of his year at the English National Stud. Getting up in the mornings is easy for these achievements, and it’s gratifying to see the agricultural sector at last being recognised in official statistics for their efforts on behalf of the previously disadvantaged community. In a recent survey conducted by “Who Owns Whom”, which appeared in the Sunday Times at the weekend, it was revealed that almost 100% of companies exceed their social investment targets, and that agriculture topped both the socio-economic and enterprise lists. The research cast its net wide in an attempt to provide a clearer picture of the contribution by the private sector towards increasing participation in the economy by a broad base of beneficiaries. Sustainability is a key business initiative, and social economic development (SED) projects are directed at benefitting communities of future customers and employees, while at the same time growing the capacity of small suppliers and customers. The agriculture, construction and mining sectors all scored high on the enterprise development chart, and that could be a result of the proliferation of small suppliers to these industries, which are supported by other beneficiaries of enterprise development. Socio-economic development scores by sector show agriculture at 101%, transport at 95%, mining and retail 94%, construction 93%, financial services 91% and manufacturing 85%. Enterprise development by sector shows agriculture at 96%, construction at 93%, mining at 92%, financial services 89%, transport 84%, retail 84% and manufacturing 83%. While it’s possible that in other emerging economies similar work is being done, it’s hard to envisage anything anywhere exceeding what South Africa has achieved. While you might argue that it was overdue and we had some catching up to do, it’s time for government to sit up and take notice, particularly when one considers that when it comes to service delivery, governments could take a few leaves from the books of farmers. We all know how destructive snow can be when it comes down heavily, as it did after the sale of two former Durban July winners, Tecla Bluff and Devon Air in 1996. It was as if the gods were objecting, and in parts of our district, the snow lay more than two feet deep. But when it comes in a few inches, as we woke to see yesterday morning, it brings the first moisture ahead of the spring, and it sprinkles our paddocks and pastures with a liberal dose of ‘free’ nitrogen. We’ve mentioned it before, that despite the Midlands’ reputation for its beautiful indigenous forests of Yellowoods, White Stinkwoods and Cape Chestnuts, the reality is these occur only on the Southern and Western-facing slopes of the valleys. The bulk of the territory was hitherto great, open savannah country, with millions of acres of waving veld, perfect for the big grazing herds of red hartebeest, eland and the black wildebeest. It was only when the European settlers first arrived here in the early 1820s that the trees you see so many of these days on your travels through our region, were first imported. Those that came from Australia were not built for snow, so that when it comes down heavily, the gums and the wattles take strain, and they shed their boughs, and often their trunks, by the drove. By contrast, those of European origin, the conifer and the cedar varieties, carry their burden with equanimity. In 1996, if you were driving past a grove of gum trees at the hight of that snowstorm, it sounded like the Great War’s Battle of Delville Wood, with the sound of gunshot banging off every few seconds as another branch or limb dismembered itself. Destruction was everywhere, and our workshop roofs collapsed under the weight of tons of the white fluff, squashing Mercedes lorries, Massey Ferguson tractors and any number of expensive implements underneath. There were tribes of Englishmen trapped in the vicinity, those who’d attended the broodmare sale, and for them to tell us this was by far the biggest snowfall they’d witnessed, was some statement. As for the horses, they are far from deterred; on the contrary, they’re invigorated by the change, and to illustrate this, we go back once again to 1996, when on the first morning, we brought them all into the stables. The following day, when we went out to gather them in again, they would have none of it, and we had no chance of catching those galloping around the paddocks, weighed down as we were by our gumboots. For the time-being though, and for as long as it’s not too heavy, we can rejoice. This fall is a godsend, and will set us up for a decent spring, and a productive foaling season. MOTHER NATURE WITH A CAPITAL "N"
Those who follow our columns will know that Summerhill’s business was built on five principal pillars, aspects of our business over which we could exercise a measure of control. There are many things in the breeding of racehorses that you can’t manage, one of these being the precision with which you apply genetics, simply because we are dealing with a hybrid animal where there are variations in every bottle. However, some fifteen years ago we came to the realisation that farming the conventional way was unsustainable in the long term, and we began to search for new solutions. Progress was slow to begin with, but if you persevere in life, you eventually find your way. Part of the revelation, and it was a big part, was the discovery of John Fair, South Africa’s unofficial guru on bio-farming. He has been a consultant to the farm for many years now, and he has turned our agricultural lives upside down. His programmes have been fundamental part of Summerhill’s success at the races, as well as seven consecutive breeder’s championships. John will be contributing the occasional article to our blog, and this is the first. It’s about harnessing the vital ingredient, nitrogen, through natural means. Read it; this could be the beginning of a change of life. SA Biofarm InstituteA coach who is serious about improving the win/loss ratio of his team will put his pride in his pocket and expose his team to coaches that have a high win track-record. That is why I took a “team” of biological farmers for a weeks training session with Neil Ballard in Western Australia. Neil is farmer, legume seed grower as well as being a national and global pasture consultant. At the end of the training week Neil was “officially” appointed as the Honorary Senior Coach to the Aspirant Springbok Biological Farming team. Neil believes in getting back to basics and his main game plan is to grow nitrogen rather than to buy it. This he does very successfully. In reality, this is a big step forward to profitable and sustainable farming. It is not just about saving’s in N fertilizer costs; another major benefit of growing N with legumes, is that the productive capacity of the soil is radically improved. Soil structure, water uptake and holding capacity and the ability of the soil to breath, are all improved. This in turn promotes soil life, health and the production of other important plant nutrients - including natural plant growth hormones and stimulants. The rule of thumb in Australia for N production derived from pasture legumes is 3% N for every ton of total dry material (DM) produced. Total DM is calculated from above ground yield plus 20% for roots. Thus from a 4 ton above ground yield the total N production can be calculated at 144 kg N (4000 + 80 kg x 3%). It must be noted that only 40% of this N will be available for the following crop. In closing I want to point out that it is of paramount importance that soil N levels should be regularly monitored when legumes are grown in a pasture or in rotation with cash crops. I am confident that the stage that will be reached when it will not be necessary to apply any N at all. Editor: Imagine a world where you do not have to spend a penny on Nitrogen fertilizer, not only from a cost perspective, but from the point of view of environmental health. Our programme, already several years old, has almost reached this stage. The USA’s Forbes magazine is one of the world’s foremost business publications. According to the 2020 team of experts and authors, they predict that by the year 2018, 20% of all food consumed in United States cities will come from rooftop and parking lot farms. Read that again : 20% of all food in the US. That’s a staggering number, and they contend that in addition to making cities more resilient, the health benefits, for both our bodies and minds and that of our planet, of consuming food grown within a small radius of our homes or workplaces, are significant. Makes you think, doesn’t it? When the premium on farmland is such that we’re having to resort to rooftop gardens, we’ll know the world is overpopulated. And hopefully, our bankers will have reason to have some respect for the balance sheets of their farming clients!